We all dream. Sometimes our dreams come true. At other times, they don’t. And then there are those times when dreams turn into nightmares. When that happened to Ravi Nirmal Sharma, the co-author of the newly launched book, DareDreamers: Startup of The Superheroes, he knew exactly what to do. Leave. And he did. His government job gave him a chance to channelise his engineering skills. But when suggestions to follow corrupt practices were made, the beautiful dream of doing what he loved, saw a sad ending. In times of grief, writing came to his rescue. It was a cathartic process that saved him from what he calls, the bleakest period of his life, like a ghost that refused to leave its perch. Times are good now and the ghosts no more haunting. 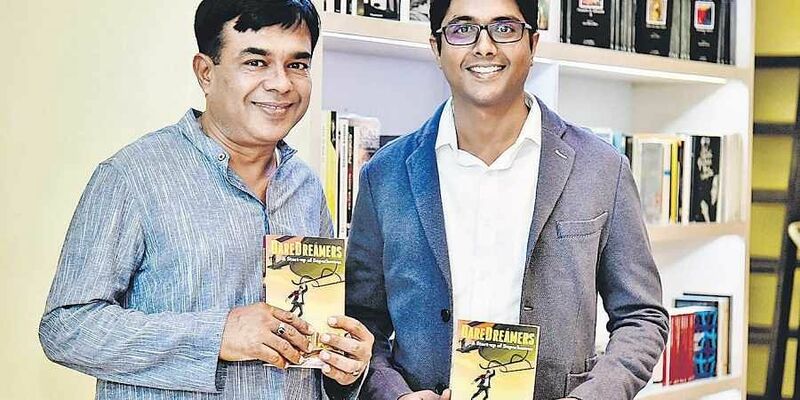 Absorbing himself into the literary world of possibilities, he and his son, Kartik Sharma, who co-authors the book, took to pen and paper in pursuit of a great challenge—to dare. While writing gave Ravi a purpose, it brought Kartik closer to a passion. He really enjoyed writing but his investment banking job never left him with any time to pursue it. Nor did it allow Kartik to think about interests that he would have liked to pursue in the future, such as working in the public health sector. Fear plagued his existence which is when he took to writing. He enjoyed it so much that all trepidation vanished. It was during this time that he started co-writing DareDreamers: Startup of The Superheroes. Then one day, he pulled the plug on his job and rest is history. Today, he also works as a public health professional. “The book has become a story that needs to be told for normalising the process of finding your passion and persevering,” says Kartik. DareDreamers is a story of Nick: a crazy inventor, Halka: an inhumanly strong human, Arjun: an Olympic-class shooter, Natasha: a Bollywood stunt-double, and Dr Vyom a medical Sherlock who work hard to build a viable business model that gives them a taste of their true purpose of saving lives. But as soon as they are ready to soar higher, they meet their nemesis in the very monster that Rasiq had barely avoided becoming himself. “DareDreamers are people who don’t just dream but dare to convert their dreams into reality with a never-say-die spirit; a very important distinction from day dreaming and each character is treated keeping these thoughts in mind,” Kartik says. And just as dare dreamers don’t let anything come between their dreams and them, the authors felt there should be no space between the two words, which is seen on the cover. It is remarkable to see two different schools of thoughts, generations and storytelling styles amalgamate seamlessly through this book. There were conflicts and differences, but both focused on their diversity to bring about a layered story. For Ravi, his son’s passion for creating value instead of wealth has become a huge inspiration. When they started writing their first book, Kartik was still in IIT, and Ravi didn’t take him too seriously. “But as time passed, when Kartik was doing his MBA, his contributions to the novel started seeming very pertinent. I realised that age is not an accurate indicator of how mature and knowledgeable one is,” says Ravi. He has been writing since he was young. He also has a considerable amount of entrepreneurial experience. Both these aspects helped the development of the DareDreamers plot. As for Kartik, being a non conformist with an agenda to preserve his individuality has been paramount. Conditioning is the single most damaging thing if it renderers you powerless in face of making the right decision, he feels. While Kartik understands its normal for people to not like non-conformists, he believes in running the race one has chosen for themselves, instead of the race society wants you to run. In this situation, writing sets him free from all associative patterns of living. “It’s an extremely introspective pursuit. It allows me to always have a baseline from where I make efforts to be a better version of myself. Additionally, writing helps me to move past things that could otherwise have derailed me. ‘The catharsis of prose’ is how Johann Wolfgang von Goethe described it after writing The Sorrows of Young Werther,” says Kartik. So did Ravi experience a sea change in his attitude when he took to writing. From a self-engrossed person ranting about his own problems in his writing, his focus has now shifted towards empathy for others. Writing this book has achieved a beautiful intention. It has bound the father and son into a world of words that will remain in their hearts for posterity.